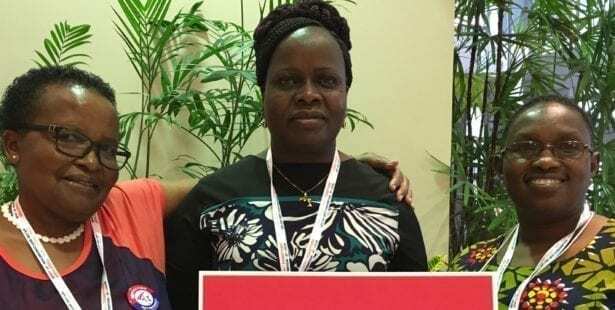 Working with our trade union allies around the world, the Solidarity Center designs and facilitates international educational exchanges for union leaders and activists from around the world. Through strategically planned activities, meetings, training sessions and roundtable discussions, participants in our exchange programs have the opportunity to meet with government officials, employers, union leaders, workers and citizens to experience firsthand the host country’s geographic and cultural diversity. Solidarity Center international delegations are hosted in part by Solidarity Center Exchange Program alumni in their home states. These alumni donate their time and expertise and resources, and act as valuable liaisons between international delegations and U.S. organizations. The Solidarity Center Exchange Program helps further our mission to assist unions and community groups in organizing and empowering some of the most vulnerable workers, such as migrants, women, young workers, domestic workers and minorities. These workers, despite constituting the majority of the workforce in some parts of the world, are the most likely to be exploited and marginalized and forced to work in the informal sector without the protection of labor laws and standards. Between six and 10 participants take part in each exchange program, and often include leaders, organizers, union members, activists, lawmakers and legal experts. Exchange programs are designed to expose the participants to the culture, work life and political realities of the host countries and include visits to up to three geographically dispersed sites during each program. State Alumni is a dynamic, interactive online global community that offers Solidarity Center Exchange Program alumni a place to network, discover grants and funding opportunities and access 20,000 international journals and newspapers. The site is exclusively for alumni and features communities to discuss ideas and topics and offers opportunities to participate in live question-and-answer sessions with experts. Exchanges Connect is a digital resource for alumni of exchange programs, youth audiences and other groups around the world interested in international dialogue of mutual interest which furthers the goal of international understanding. Solidarity Center Exchange Programs are funded by a grant from the U.S. Department of State, Office of Citizen Exchanges.